Konstantinos Lefkimmiatis, a membre of staff of the CNR Institute of Neurosciences in Padova will give a Departmental seminar on Monday the 5th of February in the Physiology lecture theatre at 12.00 noon. The seminar, entitled Phosphatases and Mitochondrial Protein Kinase A: Positive Roles for Negative Regulators, will new an major role of phosphatases in cellular signalling mediated by c-AMP and protein kinase A (PKA). The poster of the lecture can downloaded here and all members of the Department are warmly encouraged to attend. The second messenger cyclic AMP (cAMP) achieves its functional pleiotropy thanks to the compartmentalization of its signaling cascade. This is accomplished via the coordinated actions of two protein families, phosphodiesterases (PDEs) and A-kinase anchoring proteins (AKAPs). According to this paradigm, PDEs selectively hydrolyze cAMP allowing it to reach cellular domains of enriched PKA (protein kinase A) generated by AKAPs. However, another group of proteins can regulate the cAMP/PKA axis, the phosphatases. These enzymes dephosphorylate the proteins modified by PKA to effectively terminate the cAMP cascade. While the role of phosphatases in regulating PKA is intuitively important, their contribution into shaping the cAMP/PKA pathway is grossly underappreciated. To address this issue we developed and validated a number of FRET-based sensors able to monitor cAMP, PKA and phosphatase activity in the cytosol and outer mitochondrial membrane (OMM) of living cells in real time. Using as model neonatal cardiac myocytes we performed a comprehensive cell imaging study and demonstrated that differences between the cAMP/PKA axis present at the cytosol and OMM did not depend on PDEs but rather on differential phosphatase activity between the two compartments. Our imaging data, which are also supported by classic biochemistry, demonstrate that phosphatases are required for sculpting functionally distinct cAMP/PKA domains and that this occurs because of the kinetics of the bimacromolecular interaction between phosphatases and PKA-phosphorylated proteins. Dr Lefkimmiatis is a researcher at the Institute of Neuroscience CNR and a junior principal investigator at the Venetian Institute of Molecular Medicine (VIMM) in Padova. He graduated in 2006 from the University of Bari where he studied the roles of the p53 family of oncosuppressors in the progression of the cell cycle. For his postdoctoral studies he moved to Harvard Medical School where he became interested in cellular signalling. Funded by a fellowship from American Heart Association he unveiled a novel crosstalk pathway where variations of Ca2+ contained in the endoplasmic reticulum regulate cAMP events at the cytosol of non-excitable cells. After being promoted to Instructor at Harvard he started his independent work on the mechanisms that underlie the generation of cAMP and protein kinase A (PKA) microdomains, specifically at the mitochondria. He discovered that cAMP can be produced in the mitochondrial matrix however this compartment does not contain detectable PKA activity, opening the possibility of specific mitochondrial cAMP effectors. In 2013 he secured an intermediate fellowship and moved to the department of physiology anatomy and genetics at the university of Oxford, where he established his research group. In Oxford Dr. Lefkimmiatis’s group start working on two main directions. The first aims to investigate the molecular mechanisms that allow the generation of distinct cAMP/PKA events in subcellular compartments. While the second is tackling with the long-standing question of how PKA regulates cellular death, with particular attention to non-apoptotic programmed cell death forms such as necroptosis. Dr. Lefkimmiatis reviews for several international journals including eLife; Nature Cell Biology, Cell Reports, Circulation and Scientific Reports, and for several grant agencies including Medical Research Council (MRC-UK), British Heart Foundation (BHF-UK), Biotechnology and Biological Sciences Research Council (BBSRC-UK), Alzheimer’s Association (USA) and Danish Council for Independent Research (DFF-YDUN). Di Benedetto G, Gerbino A, Lefkimmiatis K. Shaping mitochondrial dynamics: The role of cAMP signalling. Biochem Biophys Res Commun. ; 2017 May 10. pii: S0006-291X(17)30900-2. doi: 10.1016/j.bbrc.2017.05.041. 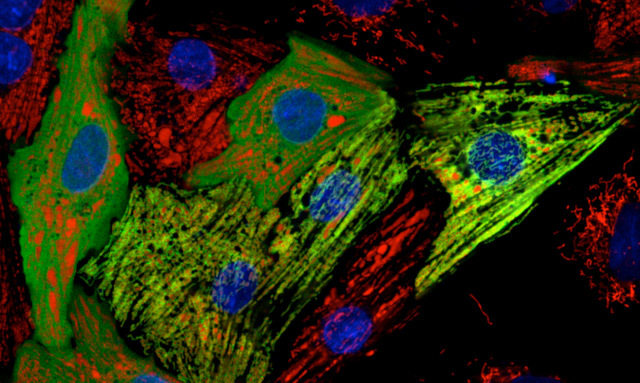 Confocal image of primary neonatal cardiac myocytes expressing mitochondrial and soluble PKA-activity sensors (green) and stained for nuclei (blue) and mitochondria (red) (courtesy of K Lefkimmiatis).